This is naive, since I'm using the same shading as for a ball, and I'm using clipping hacks to remove the shading from the hole. 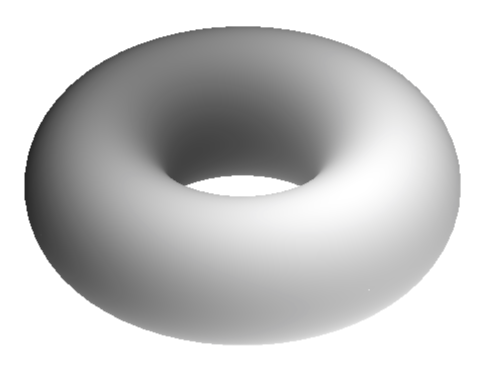 My attempt looks bad because it does not accurately reflect how light would hit the surface of a torus. Any tips for producing a realistically shaded torus would be greatly appreciated. That's not a too serious answer, but just to tell you that if you have an idea how the shading should look like, you can reverse engineer it with pgfplots. Here is an example. The trick is to play with point meta. Is this shading realistic? Certainly not (unless you have some crazy light sources). Could you make it realistic? Yes, if you know what you're doing or study the asymptote manual long enough. So if you want something realistic, use asymptote. If you want a cartoon and like to play with pgfplots, you may potentially find this useful.